This document presents an objective and systematic accounting of the strengths and weaknesses of a proposed enterprise. It identifies the opportunities and threats foreseen in the economic, regulatory and political environments. The human, financial, and technical assets required to carry out the proposed endeavor are identified, and the probability of financial success is assessed and weighted against the overall cost and risks in pursuing the endeavor. 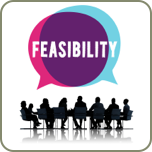 A feasibility study is often used by lending institutions or regulators in deciding whether to approve applications for loans or operating licenses, respectively. Therefore, in producing a feasibility study the audience must be left with no doubt regarding the objectivity of the analysis performed. Recommendations put forth by the feasibility analyst must be based on evidence and verifiable experience. Call or email us, or hit the button to book a call appointment.